We get a lot of comments about D's red hair. 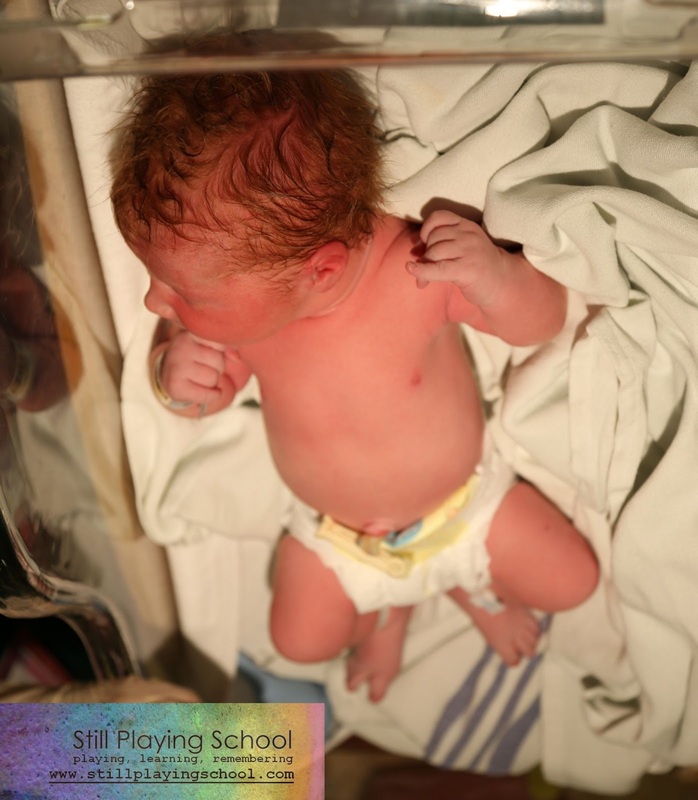 The first was just seconds after he was born, from our favorite anesthetist, Doug, who was present for all three of our children's c-sections. I'll never forget him asking, "Is that...red hair?" It was difficult to tell immediately, but after his first bath there was no denying it. We had a ginger! After E's jet black hair (at birth) and Violet's brown, we were shocked and the fact still hasn't sunk in completely. We get at least one comment everywhere we go, usually, "Where did his red hair come from?" I always answer the same way, "We aren't entirely sure, but there is red hair on both sides from his great aunts. But not...this red." But as I do more research, what I really want to answer is, "From a MC1R recessive gene on his 16th chromosome." It's also getting redder, I think. Or more "orange," as E likes to correct people who call him a red head. - Mr. SPS and I must both have a recessive gene for red hair that we passed on to D. One in four of our children will have red hair and half of them will be carriers for the hair color, even if they do not have the red hair themselves (like E). The red never shows up unless you have children with someone else who also has a recessive gene, so that explains how it can skip several generations then show up as a surprise like it did with us! - Despite what strangers like to tell me in making conversation, red hair is not becoming extinct or dying out. - D is more likely to be left handed, have a lower tolerance for pain and need more anesthesia, and has an increased ability to make vitamin D from the sun. As far as having a worse temper, the verdict is still out, at least with D. He is the most pleasant boy you can imagine 99% of the time, but it does seem to me when he gets mad or really upset, he cries much harder than E ever did. It's rare, but during these crying fits I often check to see if he's hurt because he is so very inconsolable. His toddler tantrums should be a blast! Do you have a child with red hair or does it run in your family? Do you know any other interesting facts about red hair? The more anesthesia thing is VERY TRUE, btw. And I don't have any siblings to compare her to, but she is awfully touchy about certain types of injuries. Any adhesive (Band-Aids, stickers, etc) leave marks on her skin for sometimes days, too. I don't know if there's any research about sensitive skin and red heads, but we've got that in spades! I have a ginger, too. My middle girl, Elise. She gets it from my dad. We get the comments EVERYWHERE we go, and I wonder how it's going to affect her sense of self, since my sister also has one redhead, and the color has, you could say, gone to his head. When people comment on it, I've taught her to say "thank you!" and then we talk about how smart she is, what a kind big sister she is, etc. I want her to know that she is special as she is, because of her whole self, and her red hair doesn't MAKE her special (though judging by the comments we get, she is AMAZING because of her hair). She's pretty calm, and very sensitive - just like her mom. She is very sensitive to light (blue eyes) and physical pain. Hi Devany! You know I just had to comment on this! :) The sensitivity is very true. My two brothers and I are all very bright red heads with loads of freckles and our skin is very sensitive. Obviously, to the sun, but as children we had reactions to things like scented detergents and harsher soaps. The adhesive comment that Mama Bug mentioned was also very true with us! My brothers got less sensitive as they got older, but I have a ton of allergies. I wear a medical bracelet with all my allergies listed on it. If you ever have any questions, let me know! My husband is a ginger, and the anesthesia thing is SO TRUE. most doctors know about it, though, so hopefully it will never be a problem for D. My first boyfriend was a redhead, and I have always found it sooooooo attractive!! Lucky D!! I have red hair. My parents, grandparents and most of my aunts and uncles have red hair. My husbands mother was a red head. 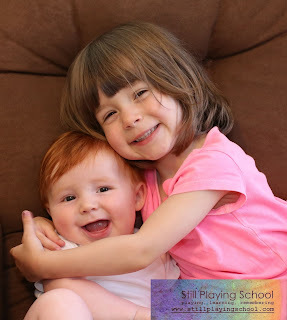 Do you think ONE of my kids would get red hair? No. They are all currently this dirty blond color that's very confusing as my husbands hair is dark brown. So cool, I didnt know those interesting little factoids. My red head is very sensitive, left handed, and Im glad to know about the anesthesia! I'm a redhead, as are both my brothers, our mother, and our paternal grandmother. There are so many things about being a redhead! A friend's redheaded daughter is now in college, and has started a ginger blog (her major is journalism) and she will spend four years researching the weirdness of our kind. My experience and what I've learned? Not only do you need more anesthesia (even for dental procedures), it has to be the right kind. Synthetic pain relievers of any type tend not to work on redheads. 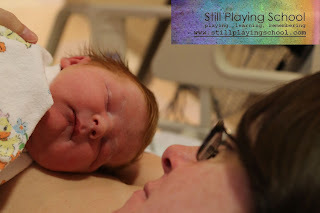 The first thing the anesthetist asked me when he came in for my daughter's birth was whether I or not I dyed my hair. He left and came back with an entirely different preparation, which was great because whatever the nurses gave me at the beginning didn't help at all. We have a higher tolerance for pain, but also a heightened sensitivity to pain. In fact, it's my understanding that the same thing that gives us more sensitive skin heightens all sensitivities (not just on the top layer of our bodies). For me, as well as my younger brother, this has translated to hypersensitivity to allergens--he's allergic to everything, and carries an epi pen on his person at all times. I lucked out that my allergies are limited to eggplant, kiwi, latex and a handful of medications. The latex one is really aweful, but it's a true allergy to the botanical protein, which is basically everywhere. My now four-year-old has never and will never play with a latex balloon. Airborn powder alone can land me en route to the ER. We also have to use latex-free bandages in our household (which means NO Disney characters). My daughter fantasizes about latex-free Disney Princess bandages. I had to be careful at moms' groups and play dates because so many diapers contain latex, so I had to stay clear of allergenic bums and changing time. If your son does develop allergies, watch them closely and work with an allergist regularly--they can get worse in a hurry, as I recently learned with eggplant and some friendly ER docs. I'm not a leftie, but I'm fairly ambedextrous, and can write with either hand, and have always eaten with my left hand.